For other uses, see Treaty of Lausanne (disambiguation). The Treaty of Lausanne (French: Traité de Lausanne) was a peace treaty signed in the Palais de Rumine, Lausanne, Switzerland, on 24 July 1923. It officially settled the conflict that had originally existed between the Ottoman Empire and the Allied French Republic, British Empire, Kingdom of Italy, Empire of Japan, Kingdom of Greece, and the Kingdom of Romania since the onset of World War I. The original text of the treaty is in French. It was the result of a second attempt at peace after the failed Treaty of Sèvres, which was signed by all previous parties, except the Kingdom of Greece, but later rejected by the Turkish national movement who fought against the previous terms and significant loss of territory. The Treaty of Lausanne ended the conflict and defined the borders of the modern Turkish Republic. In the treaty, Turkey gave up all claims to the remainder of the Ottoman Empire and in return the Allies recognized Turkish sovereignty within its new borders. The treaty was ratified by Turkey on 23 August 1923, Greece on 25 August 1923, Italy on 12 March 1924, Japan on 15 May 1924, Great Britain on 16 July 1924. The treaty came into force on 6 August 1924, when the instruments of ratification were officially deposited in Paris. Borders of Turkey according to the Treaty of Sèvres (1920) which was annulled and replaced by the Treaty of Lausanne (1923) in the aftermath of the Turkish War of Independence led by Mustafa Kemal Atatürk. After the withdrawal of the Greek forces in Asia Minor and the expulsion of the Ottoman sultan by the Turkish army under the command of Mustafa Kemal Atatürk, the Ankara-based Kemalist government of the Turkish national movement rejected the territorial losses imposed by the 1920 Treaty of Sèvres previously signed by the Ottoman Empire. Britain had sought to undermine Turkish influence in Mesopotamia and Kirkuk by seeking the division of Kurdish populated regions in Eastern Anatolia, but secular Kemalist rhetoric relieved some of the international concerns about the future of the Armenian community that had survived the 1915 Armenian genocide and support for Kurdish self determination similarly declined. Under the Treaty of Lausanne, signed in 1923, Eastern Anatolia became part of modern day Turkey, in exchange for Turkey's relinquishing Ottoman-era claims to the oil-rich Arab lands. Negotiations were undertaken during the Conference of Lausanne, where İsmet İnönü was the chief negotiator for Turkey. Lord Curzon, the British Foreign Secretary of that time, was the chief negotiator for the Allies, while Eleftherios Venizelos negotiated on behalf of Greece. The negotiations took many months. On 20 November 1922, the peace conference was opened and after strenuous debate was interrupted by Turkish protest on 4 February 1923. After reopening on 23 April, and following more protests by the Turks and tense debates, the treaty was signed on 24 July as a result of eight months of arduous negotiation. The Allied delegation included U.S. Admiral Mark L. Bristol, who served as the United States High Commissioner and championed Turkish efforts. Trade (abolition of capitulations) – Article 28 provided: "Each of the High Contracting Parties hereby accepts, in so far as it is concerned, the complete abolition of the Capitulations in Turkey in every respect." The treaty provided for the independence of the Republic of Turkey but also for the protection of the Greek Orthodox Christian minority in Turkey and the Muslim minority in Greece. However, most of the Christian population of Turkey and the Turkish population of Greece had already been deported under the earlier Convention Concerning the Exchange of Greek and Turkish Populations signed by Greece and Turkey. Only the Greeks of Constantinople, Imbros and Tenedos were excluded (about 270,000 at that time), and the Muslim population of Western Thrace (about 129,120 in 1923.) Article 14 of the treaty granted the islands of Gökçeada (Imbros) and Bozcaada (Tenedos) "special administrative organisation", a right that was revoked by the Turkish government on 17 February 1926. Turkey also formally accepted the loss of Cyprus (which was leased to the British Empire following the Congress of Berlin in 1878, but de jure remained an Ottoman territory until World War I) as well as Egypt and Anglo-Egyptian Sudan (which were occupied by British forces with the pretext of "putting down the Urabi Revolt and restoring order" in 1882, but de jure remained Ottoman territories until World War I) to the British Empire, which had unilaterally annexed them on 5 November 1914. The fate of the province of Mosul was left to be determined through the League of Nations. Turkey also explicitly renounced all claims on the Dodecanese Islands, which Italy was obliged to return to Turkey according to Article 2 of the Treaty of Ouchy in 1912 following the Italo-Turkish War (1911–1912). Part XVI Protocol relative to the Treaty concluded at Sevres between the principal Allied Powers and Greece on August 10, 1920, concerning the protection of minorities in Greece, and the Treaty concluded on the same day between the same Powers relating to Thrace. 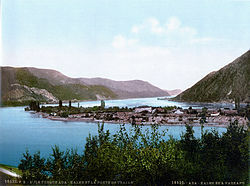 Adakale Island in River Danube was forgotten during the peace talks at the Congress of Berlin in 1878, which allowed it to remain a de jure Turkish territory and the Ottoman Sultan Abdülhamid II's private possession until the Treaty of Lausanne in 1923 (de facto until Romania unilaterally declared its sovereignty on the island in 1919 and further strengthened this claim with the Treaty of Trianon in 1920.) The island was submerged during the construction of the Iron Gates hydroelectric plant in 1970, which also removed the possibility of a potential legal claim by the descendants of Abdul Hamid II. The territories to the south of Syria and Iraq on the Arabian Peninsula which still remained under Turkish control when the Armistice of Mudros was signed on 30 October 1918 were not explicitly identified in the text of the treaty. However, the definition of Turkey's southern border in Article 3 also meant that Turkey officially ceded them. These territories included Yemen, Asir and parts of Hejaz like the city of Medina. They were held by Turkish forces until 23 January 1919. Turkey officially ceded Adakale Island in River Danube to Romania with Articles 25 and 26 of the Treaty of Lausanne; by formally recognizing the related provisions in the Treaty of Trianon of 1920. Due to a diplomatic irregularity at the 1878 Congress of Berlin, the island had technically remained part of the Ottoman Empire. Turkish and Italian delegations at Lausanne. Turkish delegation after having signed the Treaty of Lausanne. The delegation was led by İsmet İnönü (in the middle). The Treaty of Lausanne led to the international recognition of the sovereignty of the new Republic of Turkey as the successor state of the defunct Ottoman Empire. The Convention on the Straits lasted only thirteen years and was replaced with the Montreux Convention Regarding the Regime of the Straits in 1936. The customs limitations in the treaty were shortly reworked. Hatay Province remained a part of the French Mandate of Syria according to the Treaty of Lausanne, but in 1938 gained its independence as the Hatay State, which later joined Turkey after a referendum in 1939. Political amnesty was applied to the 150 personae non gratae of Turkey (mostly descendants of the Ottoman dynasty) who slowly acquired citizenship — the last one was in 1974. President Erdogan seeks revisions in the Treaty for particular reasons. ^ "Palais de Rumine". www.lonelyplanet.com. Retrieved 6 September 2018. ^ "Palais de Rumine & Musée cantonal des Beaux-Arts". MySwitzerland.com. Retrieved 6 September 2018. ^ a b c Martin Lawrence (1924). Treaties of Peace, 1919–1923. I. Carnegie Endowment for International Peace. p. lxxvii. ^ Darren L. Logan (2009). "Thoughts on Iraqi Kurdistan: Present Realities, Future Hope". Iran & the Caucasus. 13 (1): 161–186. JSTOR 25597401. ^ Morgenthau, Henry, Ambassador Morgenthau's Story, (Detroit: Wayne State University, 2003), 303. ^ a b Mango, Andrew (2002). Ataturk: The Biography of the Founder of Modern Turkey. Overlook Press. p. 388. ISBN 1-58567-334-X. ^ Xypolia, Ilia (2011). "Cypriot Muslims among Ottomans, Turks and British" (PDF). Bogazici Journal. 25 (2): 109–120. Retrieved 10 November 2012. ^ "ARABIA (YEMEN-HEJAZ) FRONT SIDE". www.osmanli700.gen.tr. Retrieved 6 September 2018. ^ "ARABİSTAN CEPHESİ - Osmanlı Web Sitesi - FORSNET". www.osmanli700.gen.tr. Retrieved 6 September 2018.